My wife and I have 4 children. And you have no idea how many times I’ve said something like, “Oh good, so-and-so will be at camp, which means I’ll have just 3 for today. So easy!” Like it’s a walk in the park to be watching 3 kids under 10 years old. Back when I had 3 children, I felt the same way about any 2. Give me any pair, and I’m good to go. Same with 2 children, and 1 child. Whenever I had N kids, it always seemed like N-1 kids was easy but that N kids was really the breaking point — which, of course, kept changing as N increased. 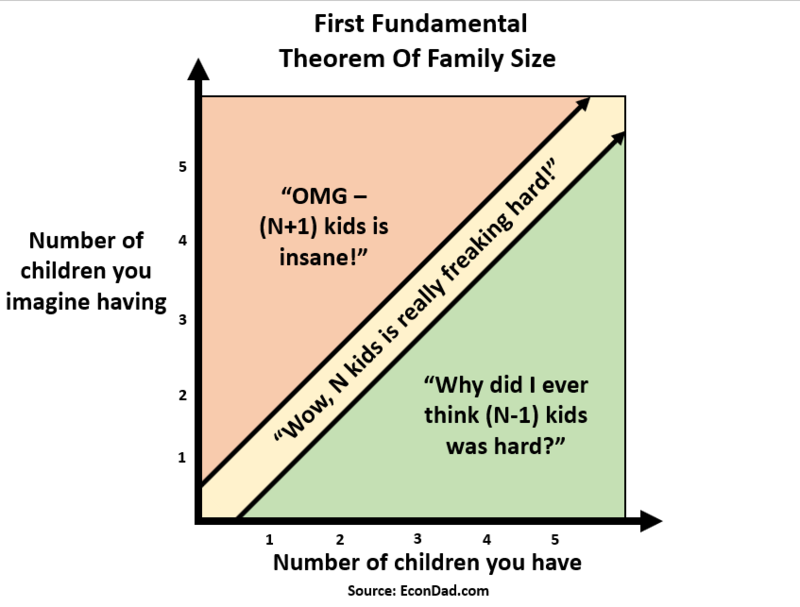 First Fundamental Theorem of Family Size: If you have N kids (no matter what the value of N), then N-1 kids is easy but N kids is hard! When things get out of control at home, you’re tempted to remind yourself how much less fighting and disruption there was with only N-1 kids. Or how much easier bedtime was with N-1. No matter how many kids you have, one less than that seems like Easy Street. 5+ Children: Bless your hearts you crazy, crazy parents. 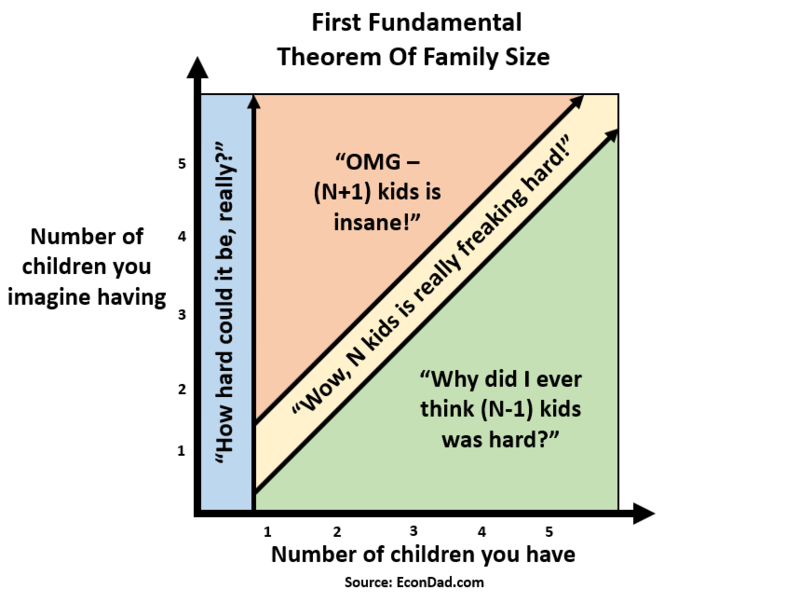 Corollary: If you have N kids (no matter what the value of N), N+1 kids sounds insane — until you decide you’ll have another, at which point it becomes a totally reasonable decision but still totally hard. You have no idea how many 3-kid parents I’ve heard say: “Well, 3 is manageable, but how in the heck do you do 4? !” Like it’s some sort of intergalactic distance between 3 kids and 4 kids. But somehow the difference is a tipping point for them, from their perspective of having just 3. I’ve also talked with quite a few families with 4 or more kids. Once you get to this family size, all bets are off. For the most part, parents of 4 or more love their big families, even if they’re a bit crazy. I wouldn’t necessarily recommend that anyone have 4 kids (it’s not for the faint of heart), but my wife and I sure love it. 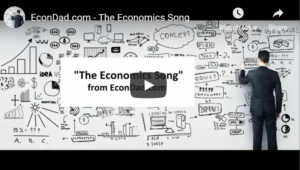 Lemma: All bets are off when you have 4 or more. These parents love having kids and may never feel like enough is enough. Sub-lemma: Although, some days it definitely feels like enough is enough. My wife is a devoted member of Physician Moms Group, a Facebook Group of physician mothers who share discussions, stories, medical advice, and a wide range of topics for doctor moms. But her real tribe is Physician Moms of Four or More, an elite subgroup of doctor moms who have four or more children. They’re a group of highly intelligent, high-energy, the-sky-is-the-limit kind of women. They’re often writing posts asking whether they should have another child, even though their lives are already insane. But they love children! They love them enough to already have 4, and the idea of another baby is more exciting than terrifying at that point. I still remember how hard it was to take care of just one child, back when we had just one. My wife would get upset when I traveled for business because she was solo taking care of our only child – all by herself – *gasp*! In reality, though, it was hard, because we had no idea what we were doing and, well, kids are hard. Parents of only children justifiably report having a hard time, because they haven’t had the experience and necessity of adapting to more. These days, you give me any one of our four kids, and I’m loving it. I can give him or her the kind of focused attention that only children get, the kind our kids rarely get in our chaotic house of six. I can talk with them, hug them, not yell so much. It’s easier than Easy Street. Give me any two or three, and I’m still doing fine. But four, wow, that starts to get tough. It’s like my high school calculus teacher used to say while driving: “Everyone faster than me is a maniac, and everyone slower than me is a moron!” While we’re speeding down the highway of life, though, what matters most is that we’re happy with our own choices. Answer: Really freaking hard. I remember how much fun it was to be one of four children (I’m the oldest, with three younger sisters). It wasn’t until I had children of my own that I realized how much harder it was to be the parent of four children. It’s fun to be part of a big family. It’s even more fun when you’re not in charge of it. So many of us say “I’d really like to have a big family someday,” but the reality of raising kids is that it’s all-consuming and actually quite challenging. Totally worth it, but still challenging. Parenting is hard even for POOPCUPs (Parents Of One Perfect Child Under Preschool – link to ScaryMommy). Before you have any children of your own, you might say something like, “I would love to have N kids someday.” After having your first child, regardless of what N was originally, all of that planning goes out the window and you usually switch to a different stopping rule, more like: “Let’s take this one kid at a time and see how it goes.” At least, that’s what we did. Final point: there’s a real issue of correlation versus causation on this. Do parents have a hard time with N kids because they keep having kids until they hit their limit — more of selection / correlation story? Or do parents have a hard time with N kids because they adapt to having N kids — more of a causation story? Consider this analogy, more of the selection story: People who have N scoops of ice cream are unsatisfied with N-1 scoops, and N+1 scoops seems like too much. Often, they end up thinking that the last scoop they had – the Nth scoop – put them over the edge and actually made them feel a bit full. But it’s a correlation rather than causation, because people who were going to feel full at N scoops actually did feel full at N scoops – that’s why they stopped before their N+1 scoop. Alternatively, here’s more of the causation story: People who earn N dollars generally see their past salary of 10-20% less and wonder how they used to get by on that, but also look their future salary of 10-20% more and think how much better off they’ll be once they get there. 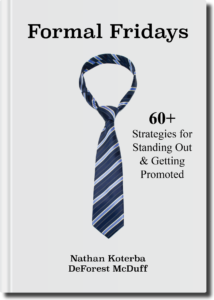 We feel this way no matter what N is, because we acclimate to our situation and adjust our expectations accordingly. No matter what N is, we adjust our mental model so that (N-1) seems easy and (N+1) seems hard. I don’t have a good sense of whether correlation or causation is the bigger driver here. Probably some of both. On the one hand, people seem to have a good sense of whether they want fewer or greater children in life (selection / correlation). 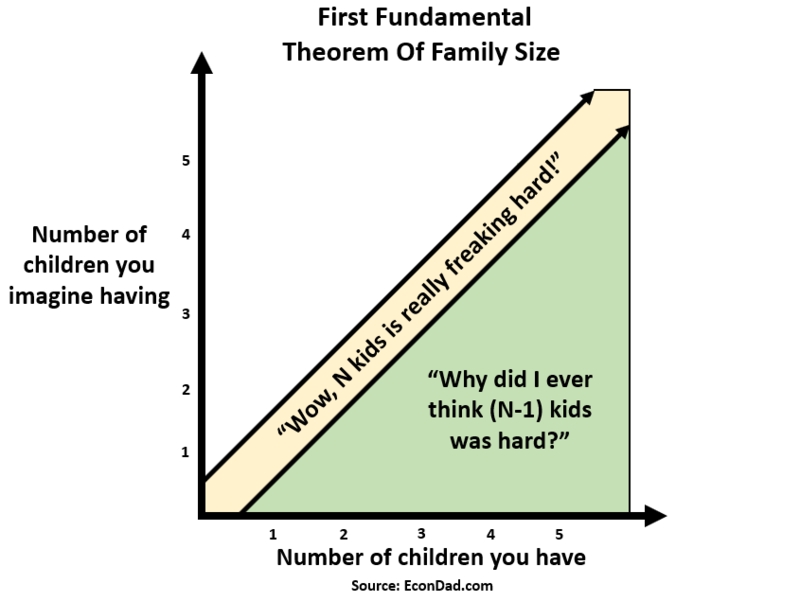 On the other hand, parents of N kids often used to be overwhelmed with (N-1) or (N-2) kids, before they had the next kid and then adjusted (causation). So there’s plausible arguments on both sides. Maybe some enterprising economist will find a natural experiment or regression discontinuity to solve this once and for all. Bottom line: I wouldn’t necessarily recommend that other families have four kids, but it works for us. Maybe we’ll have a 5th, just to make 4 seem easy. 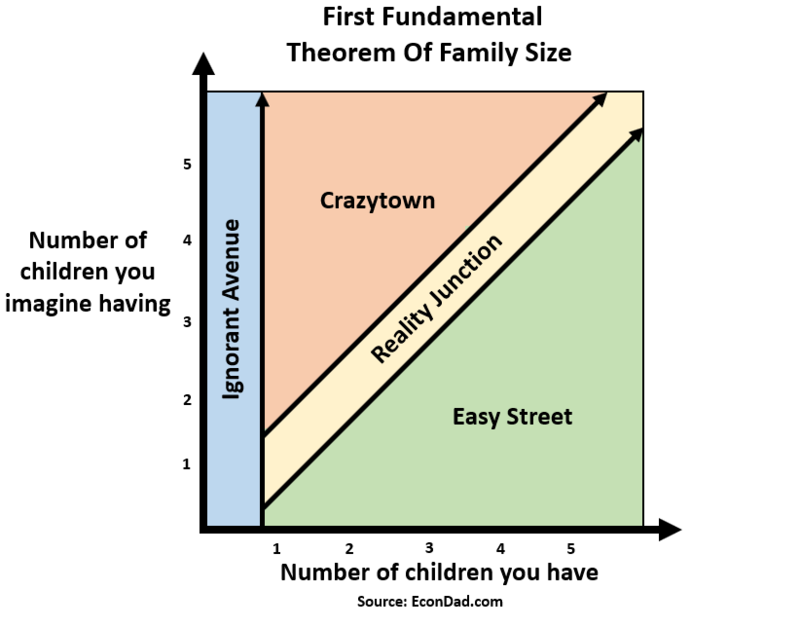 Readers: Does your personal experience support the First Fundamental Theorem of Family Size? Why / why not? I’d love to know! when N is above max(X,Y), the correlation (self-selection) effect dominates. However, triathletes also have the “X-1” number of bikes as the upper limit, with X equal to the number of bikes at which your spouse will divorce you.